In just her sixth season of World Cup ski racing, Eagle-Vail’s Mikaela Shiffrin has vaulted into the stratosphere of the ski-racing record book, whether she intended to or not. After winning back to back giant slalom races in Semmering, Austria on Tuesday and Wednesday, Shiffrin said she was just happy to win again in an event that up to that point she had only won once in her stellar career (2014 in Soelden, Austria). Then on Thursday Shiffrin won a night slalom in Semmering, the 23rd slalom victory of her career and seventh in a row since she returned from a knee injury last season. That’s one short of the World Cup record for consecutive slalom wins held by legendary retired racers Vreni Schneider of Switzerland and Janica Kostelic of Croatia. Both of those stars are ahead of the 21-year-old Shiffrin on the all-time victory list, but not by that much at the Eagle-Vail racer’s current amazing pace of claiming of World Cup wins. With 26 wins in just her sixth season on the circuit, Shiffrin is now tied for 12th on the all-time career victory list with Michela Figini of Switzerland and Tina Maze of Slovenia, both retired. Kostelic is 10th on the list with 30 wins and Schneider sits third with 55. Of course, another Vail Valley racer tops the list with an astounding 76 career wins, and she’s the only World Cup star on the list who’s still actively racing (although currently sidelined with an injury), and that’s Vail’s own Lindsey Vonn. Shiffrin is also gunning to become just the third American woman to win an overall season-long World Cup title, following in the footsteps of Vonn (American record four overall World Cup wins) and Tamara McKinney. Shiffrin came into Semmering leading defending overall champion Lara Gut of Switzerland by a scant five points. After sweeping all three tech events, Shiffrin now leads Gut 798 to 583. SEMMERING, Austria (Dec. 29, 2017) – Mikaela Shiffrin (Eagle-Vail, CO) put together a brilliant, come-from-behind second run to sweep the tech series at Semmering and take her seventh-straight Audi FIS Ski World Cup slalom victory. After winning both giant slaloms Tuesday and Wednesday, Shiffrin came into Thursday’s slalom looking for the sweep. She only led by .09 seconds over Veronika Velez Zuzulova of Slovakia after first run and Velez Zuzulova put down a seemingly unbeatable second run. Right out of the gate, Shiffrin made a big mistake and fell behind by over three-tenths at the middle split, leading the crowd to believe she gave away the win. But she let her skis run in the bottom half of the course, surprising the fans by taking the victory by .64 seconds. Velez Zuzulova finished second and Switzerland’s Wendy Holdener was third. It was Shiffrin’s 26th career victory and puts her on track to win her eighth slalom in a row in Zagreb on January 3. That would tie her with the record eight-race slalom win streak held by Switzerland’s Vreni Schneider and Croatia’s Janica Kostelic. Shiffrin also became the first racer since record-holder Schneider to win three tech races on the same hill within three days. Mikaela Shiffrin won the Semmering slalom by .64 seconds. It was her third win at Semmering in three days: two giant slaloms and one slalom. Shiffrin is one away from tying the record of eight-straight slalom wins held by Vreni Schneider (1988-89) and Janica Kostelic (2000-01). Shiffrin has won the last 12 World Cup slalom races that she started. Shiffrin also became the first racer since record-holder Schneider to win three tech races on the same hill within three days. Resi Stiegler (Jackson, WY) and Megan McJames (Park City, UT) did not finish first run. Lila Lapanja (Alpine Village, NV) did not qualify for second run. Road to Aspen: Shiffrin leads the overall World Cup standings with 798 points. Lara Gut is currently in second place with 583 points. Next, the tech women head to Zagreb for another night slalom on January 3. I felt like I was fighting and I’m proud of that. I was trying to ski fast and have some fun. I’m still searching to have a perfect run and a really fast run and put one of my best runs of training in there. Sometimes it’s better to fight and I did that today. I’m happy. I was trying to think about how Marcel Hirscher or Henrik (Kristoffersen) would ski it and I don’t think I came close to that, but I was trying to channel that energy. It took me a while to get balanced in the course. I was getting stuck and thinking I was maybe going to fall over, and I didn’t, so that was good. I’m just a 21-year-old girl! Everybody has to stop telling me these things. (laughs) I’m just trying to ski. SEMMERING, Austria (Dec. 28, 2016) – Wet, heavy snow can’t slow you down when you’re having fun. Just ask Mikaela Shiffrin (Eagle-Vail, CO), who battled through a snowstorm to win her second giant slalom in a row at the Audi FIS Ski World Cup Wednesday in Semmering. World Cup giant slalom leader Tessa Worley of France was second, followed by Germany’s Viktoria Rebensburg in third. With the victory, Shiffrin is now 35 points behind Worley in the World Cup GS standings. In the overall World Cup standings, Shiffrin leads with 698 points. Switzerland’s Lara Gut, who was sixth Wednesday, is second with 583 points. Shiffrin takes her overall World Cup lead into Thursday’s evening slalom in Semmering where she’s be gunning for her 26th World Cup victory, including her seventh-straight slalom win – one shy of the record eight-race slalom win streak held by Switzerland’s Vreni Schneider and Croatia’s Janica Kostelic. Up next, the ladies compete in an evening slalom on Thursday. Live streaming will be available on NBCsports.com/live starting at 9:00 a.m. EST. 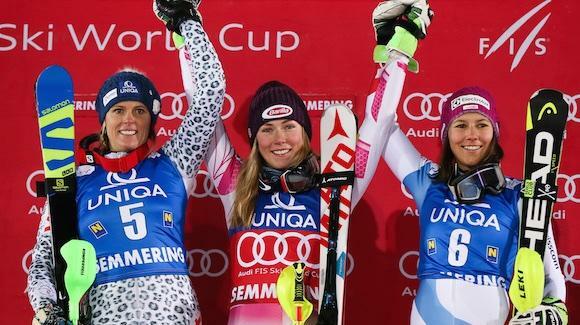 Mikaela Shiffrin won her second-straight Audi FIS Ski World Cup giant slalom Wednesday in Semmering, Austria. World Cup giant slalom leader Tessa Worley of France finished second. Shiffrin goes for her seventh-straight slalom victory in Thursday’s evening slalom in Semmering. Resi Stielger (Jackson, WY) and Megan McJames (Park City, UT) did not qualify for a second run. It was a big fight. There was so much snow coming down, I could feel my skis in the track speeding up, and then coming out slowing down. And I was like ‘oh, this isn’t good, it’s gotta be slow.’ So I kept fighting and fighting. I’m not looking at the records. I’m just happy to have another giant slalom win. Two days ago I was wondering if I would ever win a GS again, and now I have three wins, so that is a really special feeling that I have. Before I was really trying to ski just a perfect run. In these past few races I’ve thought ‘I have what I have’ and probably some of these other girls are better GS skiers than I am right now. But when I make really good turns, I think that I can win. So I just put what I have out there, don’t try to do anything more special than that, and also have some fun skiing good GS. I finally made really clean turns on the hill the past few days, which is unbelievable for me. It’s a huge milestone, so I’m really happy with that. I’m smiling more these past few days than I have all season so far. It’s two victories, but in the same place. It would be nice to repeat it at a new venue, but it’s definitely nice to feel like I can ski free for four runs in a row. Mikaela Shiffrin (Eagle-Vail, CO) won her second career Audi FIS Ski World Cup giant slalom race Tuesday in Semmering, a make up event from last week’s race that was canceled due to wind in Courchevel, France. “Today I felt really good just going for it,” Shiffrin said when asked about her reaction coming across the finish line and realizing she had won. “I wasn’t trying to ski perfect; I was just trying to ski fast. I believed in myself for the first time in a GS race, and that was very emotional. Tessa Worley of France was second, followed by Manuela Moelgg of Italy in third. Switzerland’s Lara Gut was fourth. Shiffrin extended her five-point overall World Cup lead over Gut to 55 points with Tuesday’s win. She also moved into second in the overall giant slalom World Cup standings, just 55 points behind Worley, and admitted that there is a chance she could compete for the overall giant slalom title. Up next, the ladies compete in another giant slalom Wednesday in Semmering, followed by an evening slalom on Thursday. Live streaming will be available on NBCsports.com/live starting at 4:30 a.m. EST Wednesday. Mikaela Shiffrin won her second career World Cup giant slalom Tuesday in Semmering, Austria. This is Shiffrin’s first solo giant slalom victory. Her first giant slalom victory was shared with Anna Veith (then Fenninger) in Soelden, Austria on October 25, 2014. Shiffrin’s win was her 24th overall World Cup victory. Resi Stielger (Jackson, WY) hit a rock first run and did not finish. Megan McJames (Park City, UT) did not qualify for second run. Road to Aspen: Shiffrin holds a 55-point lead over Switzerland’s Lara Gut in the overall World Cup standings. Tessa Worley of France leads the overall World Cup giant slalom standings by 55 points over Shiffrin. I keep training GS; eventually I have to get good at it, right? That’s my philosophy. Slalom, I make sure to ski it every now and then, but I’ve been doing a lot of GS and hopefully it helps my GS and doesn’t hurt my slalom too much. I think about it and it’s a dream to win. But I’m not expecting to win this year. Lara (Gut) is so strong in every event, and her GS has been really strong too. But I’m just trying to focus on giant slalom and slalom and see what happens. Today I felt really good just going for it. I wasn’t trying to ski perfect; I was just trying to ski fast. I believed in myself for the first time in a GS race, and that was very emotional. To win, that’s amazing. But I don’t expect to win every GS now. So many times in GS I think, ‘Oh man, I won that by two seconds!’ And then I see that I’m two seconds behind, and then I’m like, uh-oh, that’s embarrassing. I never really know for sure, but I had a feeling because I was fighting for it. But I was surprised when I saw the green light, and it was a really nice feeling. At this point, there is still a chance. But I have to ski really, really well in every race for the rest of the season. Right now, I’m just trying my best to fight in each race and have fun with it. Today was really fun, and I like that feeling.